Dr Bronner`s Lavender Organic Hand Sanitizer kills germs with a simple formula: organic ethyl alcohol, water, organic lavender oil, & organic glycerin- that’s it! None of the nasty chemicals you find in conventional sanitizers, but just as effective. Spray the Organic Hand Sanitizer onto palm of hands to quickly kill bacteria when no soap and water are available! Or use as deodoriser: spray twice or more into the air to enjoy a wonderful lavender aroma. Spray on children’s hands and faces to clean up sticky messes, just wipe clean! 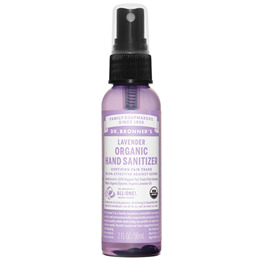 Below are reviews of Dr Bronner`s Organic Lavender Hand Sanitizer - 59ml by bodykind customers. If you have tried this product we'd love to hear what you think so please leave a review. Beautiful Perfume! Not harsh. Clean. Leaves hands soft and fresh. I love this product. It appears far better than the run of the mill sanitisers. It is gentle on the hands and has a lovely, natural odour.